In December, the European Central Bank bought just €4bn of corporate bonds, the lowest amount in any month since its purchases began last summer. The depressed levels of buying were clearly linked to a Christmas hiatus, but they also prompted speculation over how the scale of future purchases might play out. The central bank has indicated it will reduce its overall purchases, across all asset classes, from €80bn to €60bn at the end of March, though its buying will continue until the end of 2017. For investors already grappling with the prospect of rising inflation and political uncertainty, one of the most pressing questions is how a tapering process might play out specifically for European corporate bonds. The ECB has been buying corporate credit since June last year as part of a broader attempt to stimulate the continent’s economy. “In terms of pricing, there’s no question [the extension of bond buying to corporate paper] has had a material positive impact,” says Adam Bothamley, global head of debt syndicate at HSBC. The ECB has bought €54bn of corporate bonds so far, according to the latest data, as part of over €1.5tn of ECB asset holdings in total. The size of the potential fall in corporate purchases, as part of an overall reduction in buying, is a puzzle for markets. Analysts at JPMorgan this month suggested the low purchases in December “fell by more than would be expected from seasonality alone”, though they added it was likely to reflect a relative decline in credit markets over the festive season. The ECB’s reduction in overall purchases comes in a context in which markets have complained of a scarcity of high quality assets. Minutes from last month’s ECB meeting showed that the decision to trim bond purchases came partly because of concerns over the amount of assets available to buy. In December, the central bank initiated a programme to lend out government bonds, which followed concerns from Europe’s repo markets that there was a shortage of collateral to back short-term loans. As such, many market participants believe sovereign bonds could be downsized more rapidly than other sectors. “We put the bulk of reduction in asset purchases in government bonds,” says Michel Martinez, the chief euro economist at Société Générale. The bank’s main scenario is the ECB will announce a €10bn reduction in asset purchases in June. Zoso Davies, a credit strategist at Barclays, agrees that the point on scarcity is “very specific to government bond markets”. He argues that data from the month ahead will provide clues as to the future trajectory of ECB corporate tapering, and that in March monthly corporate bond purchases will go from €8bn to €6bn a month. “The January numbers are going to be important to give us a view on what the asset purchase split is — any deviation from that will be very interesting,” he says. The debate around ECB bond purchases has come at a pivotal moment for European markets. This week, Larry Fink, chief executive of BlackRock, pointed to a series of flaws in Europe’s bond markets, which have struggled to catch up to the US. The ECB’s purchases, aside from their positive effect on pricing, have been seen by some as a factor that helps unify the continent’s markets. “They have accelerated a trend that was already in place which is a maturation of the euro market, a greater depth of the euro market,” says Mr Bothamley. “A lot of issuers who come to the euro markets do access maturities that are not as readily available in the US, such as 7 years or 15 years,” he adds, pointing out that in some areas there is more innovation and flexibility in Europe than across the Atlantic. Tapering in corporate bond buying could therefore have an unintended impact on broader trends in the evolution of Europe’s capital markets, especially when placed in the context of the impact of Brexit on European financial services. Whatever the ECB decides to do when it comes to reducing bond purchases, there is little question that their decisions stand to have a significant impact on pricing. Even though spreads have underperformed relative to US credit, and rising inflation has provoked concern among investors, bonds are still trading at elevated prices. When news broke last week of emissions allegations directed at Fiat Chrysler, the company’s euro-denominated senior bonds fell several percentage points, but were still trading significantly above par. The sheer amount of focus on ECB decisions highlights the extent to which pricing in European credit markets has become heavily dependent on the actions of one central authority. This has created an environment in which the most unnerving risks are linked to the very policies that were introduced to provide stability. “It is undeniable that there is a chance they maintain it — there is even a tail risk that the corporate bond purchase programme is upsized,” says Mr Davies. James Jesus Angleton, who ran counter-intelligence for the Central Intelligence Agency from 1954 until 1975, once described his world as a “wilderness of mirrors”. The heads of America’s intelligence agencies must have felt a similar sense of surreal disorientation, when they briefed Donald Trump last week. The directors of National Intelligence, the CIA and the Federal Bureau of Investigation were charged with describing a Russian intelligence operation. The difficulty was that the intended beneficiary of that operation was none other than Mr Trump himself. Moreover, the president-elect had already publicly derided the spies’ work on Russian hacking during the election. The clash between the president-elect and America’s powerful “intelligence community” has led many wiseacres to suggest that Mr Trump is making a dangerous error. It is said they could easily destabilise the new president. The idea that the spooks are more powerful than the president himself sounds worldly. But it is almost certainly wrong. If there is a struggle between the White House and the intelligence agencies, Mr Trump is clearly in the more powerful position. The legal, political and bureaucratic prohibitions placed on the intelligence agencies spying on Americans — let alone the president — are formidable. It is true that the spooks are powerful and well-resourced actors in the Washington system. But their main skill is gaining the ear of the president in struggles with other government agencies. When the president is the problem, it is less clear what the spies can do. In any battle between the spies and the White House itself, the intelligence community’s only real resort is to brief or leak against the president. But there are no guarantees that this will be effective. In 2004, CIA officials were widely accused of briefing against the administration of George W Bush, reflecting the agency’s discontent with the handling of the Iraq war. The Wall Street Journal even ran an editorial headlined “The CIA’s insurgency” and accusing “senior rungs of the agency” of “clearly trying to defeat President Bush and elect John Kerry”. But if regime change was indeed the intention, the CIA failed. Mr Bush was re-elected. The whole controversy highlights a divergence in the international and domestic images of the US intelligence agencies. For the global left, the CIA has always been regarded as a sinister rightwing organisation supporting a reactionary world order. But in Washington the CIA is often regarded with suspicion by conservatives who believe it to have a liberal bias. The agency is, after all, full of people with advanced degrees and knowledge of foreign languages, who tend to raise tiresome factual objections to the right’s worldview. This tension between some of Mr Trump’s close advisers and the intelligence agencies could become a recurring theme. One of the fascinating subplots of last Friday’s meeting between Mr Trump and the intelligence chiefs was that it placed Michael Flynn and James Clapper in the same room. Gen Flynn will head the National Security Council staff in the Trump White House. But in 2014 he was sacked as head of the Defence Intelligence Agency by Mr Clapper, the director of National Intelligence. Ever since, General Flynn has argued vociferously that the US intelligence community has failed to understand the true threat from Islamist terrorism. Given his contempt for his old colleagues, the tensions between the spies and the White House could extend well beyond the question of Russia. While there is little reason for Mr Trump to fear plots by the spies to destabilise his administration, picking a fight with the intelligence agencies could still be a bad idea for other reasons. Many of the most difficult foreign-policy decisions that he will have to make will rely on intelligence assessments. But it could be hard for Mr Trump to cite secret intelligence in support of action against, for example, North Korea given that he has publicly mocked the CIA’s work. However, Mr Trump’s ability to brazen his way through contradictions and embarrassment could make this problem more apparent than real. The new president will simply claim that the intelligence agencies’ performance had radically improved after his appointees had been placed in charge. By contrast, the intelligence community has every reason to fear the Trump White House. Mr Trump will appoint their leaders, he will control the trajectory of their careers and, judging by congressional Republicans’ efforts to loosen civil service protections, he may soon have the power to fire them at will. The question of the “politicisation” of intelligence is hardly new. It was raised in acute form during the Bush administration’s drive towards war in Iraq. Nonetheless, the idea that it is the job of the spies to present the unvarnished truth to the president remains fundamental to the way the system is meant to operate. Mr Trump has made very clear that there are certain truths he is not keen to hear. The furore over Russian hacking forced the president-elect to give the current intelligence chiefs an audience. But once he is firmly installed in the White House, he will be in a much better position to impose his will and views on the CIA, the NSA and the FBI. After all, he will be the boss. AS A new trading year began this week in the art-deco tower that houses the Chicago Board of Trade, big men were clustered around pits dealing in futures and options tied to various commodities. Their approach dates back to the building’s opening in 1930, and was once familiar in cities throughout America. But after decades of attrition, on December 30th the CME Group (named after the Chicago Mercantile Exchange) closed the “open outcry” trading pits that it operated in New York. In America, Chicago’s hue and cry has become unique. Even this exchange is a shadow of its former self. There are now nine pits, down from 32 in 2007. A once teeming trading floor was closed in 2015. Most activity in the contracts still traded in the pits is electronic. 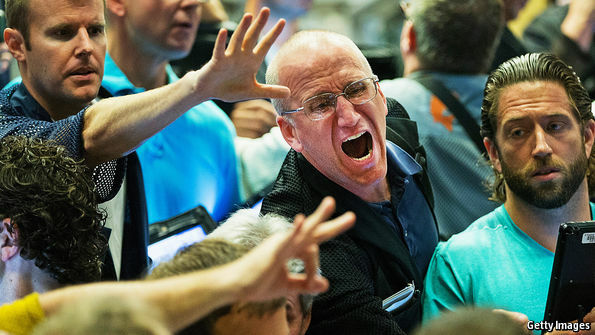 No one in the surviving CME pits in Chicago seems worried by the New York closures. But they have a symbolic impact. The markets have long been a colourful, fractious component of America’s financial architecture. They have always lured the ambitious. Two alumni of New York’s commodity markets have joined the Trump administration. Gary Cohn parlayed a cab ride into a job as a silver trader, into a position at Goldman Sachs, and, eventually, that bank’s presidency. His new post is as Mr Trump’s chief economic adviser. Vincent Viola swapped a job at an exchange for Virtu Financial, the electronic-trading firm he founded that made him a fortune. He will be nominated as army secretary. Tales of failure as well as of success abound. A scandalous default in the potato market in the 1970s wiped out several firms. A failure to corner the silver market in the 1980s led to the spectacular bankruptcy of one of America’s richest families. The destruction of the World Trade Centre in 2001 obliterated the floor used by four of New York’s commodity exchanges but even before the flames were extinguished they were back to business, some in small temporary facilities like technological junk shops, knit together by familiar cries. In the end it was not scandal or terrorism that undermined open outcry; it was efficiency. Computers turned out to be quicker, cheaper and more precise than humans. Almost all the important contracts ended up in the hands of the CME Group, which was first to realise that the most dynamic business was not in traditional commodities but in interest rates, stock indices and currencies. The strong volume these products provided enabled the CME to create economies of scale in clearing and trading systems, and to scoop up other exchanges as they faltered. Bit by bit, the exchange has shed its real-estate assets. The Board of Trade building was sold in 2012 and the equivalent New York facility in 2013. This contraction, however, is far from reflecting the health of overall business—which is booming. In 2016 Brexit, the American election and India’s monetary experimentation, to cite just three examples, each created demand for futures and options tied to interest rates, precious metals and currency. Transaction volume on the CME grew by 12% to reach a new record. The markets are more important than ever, even if, increasingly, they can be neither seen nor Heard. CAMBRIDGE – As US President-elect Donald Trump prepares his administration’s policy toward China, he should be wary of two major traps that history has set for him. The “Thucydides Trap,” cited by Chinese President Xi Jinping, refers to the warning by the ancient Greek historian that cataclysmic war can erupt if an established power (like the United States) becomes too fearful of a rising power (like China). But Trump also has to worry about the “Kindleberger Trap”: a China that seems too weak rather than too strong. Charles Kindleberger, an intellectual architect of the Marshall Plan who later taught at MIT, argued that the disastrous decade of the 1930s was caused when the US replaced Britain as the largest global power but failed to take on Britain’s role in providing global public goods. The result was the collapse of the global system into depression, genocide, and world war. Today, as China’s power grows, will it help provide global public goods? In domestic politics, governments produce public goods such as policing or a clean environment, from which all citizens can benefit and none are excluded. At the global level, public goods – such as a stable climate, financial stability, or freedom of the seas – are provided by coalitions led by the largest powers. Small countries have little incentive to pay for such global public goods. Because their small contributions make little difference to whether they benefit or not, it is rational for them to ride for free. But the largest powers can see the effect and feel the benefit of their contributions. So it is rational for the largest countries to lead. When they do not, global public goods are under-produced. When Britain became too weak to play that role after World War I, an isolationist US continued to be a free rider, with disastrous results. Some observers worry that as China’s power grows, it will free ride rather than contribute to an international order that it did not create. So far, the record is mixed. China benefits from the United Nations system, where it has a veto in the Security Council. It is now the second-largest funder of UN peacekeeping forces, and it participated in UN programs related to Ebola and climate change. China has also benefited greatly from multilateral economic institutions like the World Trade Organization, the World Bank, and the International Monetary Fund. In 2015, China launched the Asian Infrastructure Investment Bank, which some saw as an alternative to the World Bank; but the new institution adheres to international rules and cooperates with the World Bank. On the other hand, China’s rejection of a Permanent Court of Arbitration judgment last year against its territorial claims in the South China Sea raises troublesome questions. Thus far, however, Chinese behavior has sought not to overthrow the liberal world order from which it benefits, but to increase its influence within it. If pressed and isolated by Trump’s policy, however, will China become a disruptive free rider that pushes the world into a Kindleberger Trap? Trump must also worry about the better-known Thucydides Trap: a China that seems too strong rather than too weak. There is nothing inevitable about this trap, and its effects are often exaggerated. For example, the political scientist Graham Allison has argued that in 12 of 16 cases since 1500 when an established power has confronted a rising power, the result has been a major war. But these numbers are not accurate, because it is not clear what constitutes a “case.” For example, Britain was the dominant world power in the mid-nineteenth century, but it let Prussia create a powerful new German empire in the heart of the European continent. Of course, Britain did fight Germany a half-century later, in 1914, but should that be counted as one case or two? World War I was not simply a case of an established Britain responding to a rising Germany. In addition to the rise of Germany, WWI was caused by the fear in Germany of Russia’s growing power, the fear of rising Slavic nationalism in a declining Austria-Hungary, as well as myriad other factors that differed from ancient Greece. As for current analogies, today’s power gap between the US and China is much greater than that between Germany and Britain in 1914. Metaphors can be useful as general precautions, but they become dangerous when they convey a sense of historical inexorableness. Even the classical Greek case is not as straightforward as Thucydides made it seem. He claimed that the cause of the second Peloponnesian War was the growth of the power of Athens and the fear it caused in Sparta. But the Yale historian Donald Kagan has shown that Athenian power was in fact not growing. Before the war broke out in 431 BC, the balance of power had begun to stabilize. Athenian policy mistakes made the Spartans think that war might be worth the risk. Athens’ growth caused the first Peloponnesian War earlier in the century, but then a Thirty-Year Truce doused the fire. Kagan argues that to start the second, disastrous war, a spark needed to land on one of the rare bits of kindling that had not been thoroughly drenched and then continually and vigorously fanned by poor policy choices. In other words, the war was caused not by impersonal forces, but by bad decisions in difficult circumstances. That is the danger that Trump confronts with China today. He must worry about a China that is simultaneously too weak and too strong. To achieve his objectives, he must avoid the Kindleberger trap as well as the Thucydides trap. But, above all, he must avoid the miscalculations, misperceptions, and rash judgments that plague human history. Putin is the winner as Washington melts down over Russian hacking. What a spectacle. Two weeks before a peaceful democratic transition of power, Democrats are using Russian cyber hacks as an excuse to explain their defeat, and Donald Trump is playing into their hands by refusing to acknowledge that Vladimir Putin is no friend of America. The only winner here is Mr. Putin, who must be laughing at his success in causing Americans to mistrust their own democratic system. 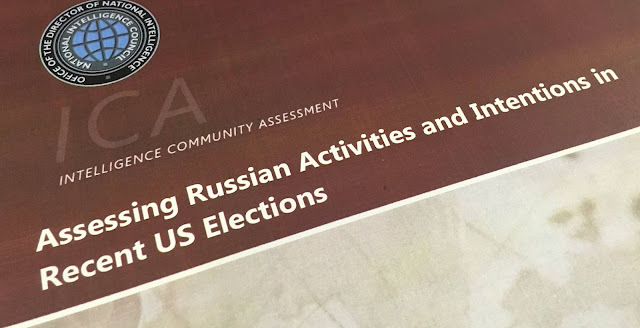 The U.S. intelligence community (IC) late Friday finally released a declassified version of the report on Russian hacking that President Obama had requested before he leaves office. The surprise is how thin it is. The report is made up mostly of top-line conclusions, while seven of the 25 pages are devoted to RT, Mr. Putin’s propaganda arm whose anti-Americanism is well known. The IC report says it couldn’t release details without betraying intelligence sources or methods, but that didn’t stop leakers from whispering some of those details to NBC and the Washington Post. The Post reported that the U.S. overheard Russian officials gloating after Mr. Trump’s victory, saying it would be good for Russian interests. A fair inference is that White House officials authorized those leaks to embarrass Mr. Trump and suggest the election was stolen by the Kremlin. Yet the report offers no evidence or judgment that the hacking influenced the election result. The leaks from Clinton aide John Podesta’s email and the Democratic National Committee were embarrassing in their candid views of individuals, but they included no bombshells. The emails that really hurt Mrs. Clinton’s electability were those she kept on a private server while Secretary of State. She lost anyway, and for reasons unrelated to the Kremlin. But Democrats and the left want to maintain the stolen-election line because they want to undermine the Republican ability to govern and repeal the Obama agenda that voters rejected at the polls. As for Mr. Trump, he keeps playing this poorly even by the needs of his own political interests. For weeks he insisted that the Russians may not have done the hacking, though WikiLeaks and Guccifer 2.0 are favorite Russian outlets. He picked needless fights with the intelligence services he will soon need as President. He even cited Julian Assange’s claim that Russia wasn’t the source of WikiLeaks’s campaign dump of Democratic emails, as if Mr. Assange isn’t a practiced liar and deeply anti-American. The smart line from the beginning would have been to denounce the hack, acknowledge that Russia has been acting in ways that harm the U.S., and say that Mr. Putin should stop or face consequences once Mr. Trump is President. Mr. Trump could also say that if Mr. Obama had retaliated sooner against Russia, the election hacks might not have happened. Instead, Mr. Trump’s denial of Russian reality makes him look like a sap for Mr. Putin. Let’s hope so, but it isn’t “stupid” to mistrust Mr. Putin. After his sheltering of Edward Snowden, his invasion of Ukraine, annexation of Crimea, intervention in Syria, sale of anti-aircraft missiles to Iran and massacre of civilians in Aleppo, only a fool would imagine that Mr. Putin can be trusted beyond the cold logic of military and economic balance of power. Mr. Trump may be able to build a better relationship with the Russian strongman, but then that’s also what George W. Bush and President Obama thought. Mr. Bush thought his good-old-boy bonhomie could charm him, while Mr. Obama thought the example of his claims to moral superiority would persuade him. Mr. Trump seems to think his advantage will be his superior deal-making skills. But Mr. Putin respects power, and nothing else. If Mr. Trump wants Russia to respect U.S. interests, he will have to show Mr. Putin that he will pay a price for damaging those interests. This means not covering up nuclear arms-control violations, as Mr. Obama did, and not dismissing or apologizing for Russian cyber attacks, as Mr. Trump has been too close to doing. Mr. Trump won the White House fair and square, and he could help himself by acting like it. The best defense against Russian cyber attacks is to show Americans and the world that he knows better than Mr. Obama how to use U.S. power to deter them. Instead of assailing every critic out of political and personal vanity, it’s time for Mr. Trump to realize that the best revenge against his implacable opponents is to succeed as President.